Glorious day of rest. I told my body to relax and it did. A.M. Started with Jeff and Daniel. Daniel turned around at 1.5. Then we met Luz and she ran a little bit more than 3 miles with us. Her 3 mile split was 24:21, mile splits - 7:57, 8:04, 8:21. This was not a planned tempo run for her. I noticed she was going around 8:00 and chatting, and I just did not say anything until she started slowing down when we hit the bridges and uphill with less than a mile to go. What boggles my mind is how in the world she manages to chat so much at a pace that she cannot sustain a mile later. She chats with as much ease at 8:00 pace as I do at 6:30. Total time for 8 miles was 1:05:26, avg. HR 113. P.M. 1 with Julia in 10:04, then 2 with Benjamin in 15:49, including 3:09 0.5. Pushed Jacob, and it had some hills, so counting this 0.5 as marathon pace. Jenny joined us for 1.5 in 12:40. Five Fingers - 774.25 miles. A.M. 6 miles with Jeff in 47:55. Daniel and Matt joined us at different times. P.M. 2 with Benjamin in 15:30. Jenny joined for 1.5 in 11:55. 1 with Julia in 9:08. Pushed Jacob while running with Benjamin and Jenny. Five Fingers - 780.25 miles. Executive summary - 2:34:43, 8th or 7th place (depending on what they do with the Colorado runner that missed the turn into the subdivision), 1st from Utah, $500. 6 Kenyans at the start, 6 Kenyans at the finish. Looks like Bob Wood said no travel expenses unless you finish. Good move for him. Tight left calf from the start of the race contributed to running slow, and is hurting like there is no tomorrow now, but on the positive side quads seem intact. Details to follow. Stayed with Adam Wende the night before. Got up at 2:45, made the bus without an incident (unlike last year). Noticed a tightness in the left calf during the warm up. I've actually had this tightness the entire week, but figured it was one of those taper cramps. For some reason the muscle responds to reduced mileage with occasional cramping. So when I felt it I thought, no big deal, it will go away because it always has even when I felt it on race day. But it did not before the start. I figured it would go away as the race progressed, and proceeded to execute the plan. The plan was to hit pretty much exact same splits I did in the 16 mile tempo 10 days earlier, and then see how I would fare after that. Last year I started slow, ran strong after 10, then by 20 the strength had left me, and I finished at about the same pace I did in 2006 when I started fast only it took me a minute longer to get to 20, so I ended up finishing a minute slower. I ignored the competition, and took off. I figured they would eventually catch me, and when they did try to hang with them for as long as I could, and I figured I wanted to be at the top of the Little Mountain with the Kenyans because then it is downhill again and I'd be able to hang with them a little more. Seth told me he was not feeling that great, so he wanted to start a little slower. Steve Ashbaker was there as well, and acted as a threat from behind if I let my guard down. Downhill, 8% grade. 4:50, 4:51. Perfect. The first mile felt good, I was going to guess 5:00-5:10 by the effort. So I was pleased to see 4:50. Then the calf started hurting more and I eased off on the third mile. 4:52 instead of planned 4:48. Now gradual flattening out. 5:18 (plan 5:10), 5:35 (plan 5:25), and 5:56 (plan 5:45). Reached 6 miles in 31:15 vs 30:54 in the tempo run. Calf pain has been getting progressively worse, but I took it as a positive - when it goes away I'll be able to run faster. On the positive side, the breathing kept getting lighter. So at least the fitness was OK. Right around mile 5 a white guy whose exact name I still do not know who is rumored to be from Colorado went by me and I could not latch on. After the first 6 miles we started a climb up the Little Mountain. Back in the days of the old DesNews course when we did not experience the Big Mountain I wondered why that mountain was called Little. It is a climb of 1.5 miles during which you gain about 300 feet of elevation. That sounded pretty big, but not when you look at the Big Mountain that drops 1500 feet or so in 3-4 miles. 6:38, plan was 6:30. Seth passed me. However, he was not moving as fast as I expected him. That could mean two things. He is either holding back, or is he is as sick as he thinks he is. I think the climb gave my calf a break and stretched it a bit. Next mile in 6:03 (plan 6:00), and I felt strong. However, now a VPB is looming. Does not look like I can hold it. Had to pull off to the side of the road and do my patented (clean!) 5 second job. Still managed 5:32 mile (plan 5:20). The Kenyans finally caught me, and I ran with them for a minute or so. Went into the subdivision. This allowed me to measure the gaps. Seth had a bit less than a minute on me. Steve and a stray Kenyan runner were about 30 seconds behind. Next mile 5:56 (plan 5:45). I was hoping that running with the Kenyans would give me a better time on that mile. Reached 10 miles in 55:22, vs 54:49 in the tempo run. Next 2 miles were both 5:37. I had an approximate plan of 5:30-5:35 for them as I was not exactly sure about their quality. During the tempo run I eased off at that point to about 6:00 with Seth and Jeff. But this was within range. However, 5:46 on the next mile gave a cause for concern. What was strange is that I was not feeling bad, nothing was wrong except I felt I was running way too easy but could not go any faster. Probably what was happening is that the calf kept getting tighter and tighter, but because of the endorphines the pain was not getting any more acute, nevertheless the push off power kept getting reduced, so I was running slower and slower. 1:12:57 at the half vs 1:12:49 in the tempo run. Even with the ease-off between 10 and 12 I still could not catch my tempo run guy. Next two miles in 5:50 and 5:49. 1:24:01 at 15 miles vs 1:23:26 in the tempo run. The plan was 5:35 for both. At this point I realized I needed to ditch the plan and just hang in there hoping Steve won't pass me, and hoping for the best in general. Maybe the calf pain will go away and I'll be able to close strong. Saw Seth in the distance. My first thought was that he failed to keep up with the Kenyans when they caught him, and from that point just decided to run for first Utahn, the slowest it takes. Which would mean he would run with me, then blow me away on the last mile. That's OK, at least I'll have somebody to run with. Or maybe not, maybe he is just plain out of commission with no guile involved. The stray Kenyan runner caught up to me, and I followed him for about a mile. We ran the next mile in 5:48, which had the uphill by the Hogle Zoo. This gave me 1:29:48 at 16 miles vs 1:29:15 in the tempo. This gave me some hope. However, the next two miles showed the hope was vain. I felt decent but the pace kept getting slower. The next two miles which were a net downhill produced a split of 12:24, 6:12 average, and a 1:42:12 split at 18 miles. 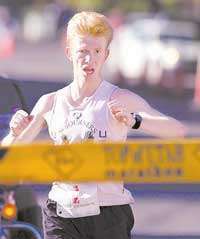 The grim reality of having to run slower than 6:00 for the rest of the race began to show its ugly face. By this time I had caught up to Seth. We chatted. He told me he was struggling. I told him to run with me and finish the race no matter what. 1:54:41 at 20 miles. 12:29 for the next 2 downhill miles. At least it is not getting any uglier. Seth dropped back. I felt very perky on the next uphill mile. So perky that I thought for sure it would be under 6:20. Good luck - 6:42. Last year 6:33. I guess the quads were perky, the fuel system was perky, but the dysfunctional calf spoiled the show. Next downhill mile in 6:07. Last year 5:45. So we are starting to see a pattern. I am losing in both direction, but more on the downhill. Mile 23 brought some excitement into the drudgery. 6:14 with some uphill on 13th South. I see a Kenyan ahead of me, but do not feel like going out of my way to chase him down. What's the glory in passing a Kenyan that is in a hopeless out-of-money position? He is just doing a training run to finish. Now if passing him meant his money is now yours then it is a different story. Then you indeed are racing a Kenyan. Mile 24 in 6:20. Two more to go, and all of a sudden it is warmer as the course turns from the shade South Temple into the sun on 300 East. The downhill ends as well. Mile 25 in 6:24. Now the nasty last mile. It starts going uphill, it is still out in the sun, and it has a long stretch of straight road, you count the blocks. I guess the problem with the straight road is that when you are in pain you can maintain your focus better by setting small goals. Get to this landmark, then get to that landmark. Luckily I know how nasty it is, I also know exactly where you turn, and I know how blocks work in Salt Lake City. So that makes it easier. 2:33:15 at mile 26, 6:47 split. Very unspectacular, but with the calf problem could be a lot worse. And as usual, my local competition suffered more than I did at that point, so nobody passed me. Last 385 yards in 1:28, 6:42 pace for the "kick". Steve Ashbaker was about 30 seconds behind me at 20 miles, about 1 minute behind me at 25, and then he had to stop for a couple of minutes to throw up. So he finished in 2:38. Seth barely held off Bill Cobler at the end finishing in 2:45. Joseph Chirlee 2:18:16, Jynocel Baswell 2:19:31, Edward Korir 2:19:51, Jon Ndambuki 2:20:33. Ndambuki ended up out of money with the fastest time he's ever run on this course (2004 does not count, it was short). P.M. The calf was very sore. Could not walk without a serious limp for a while. Iced it, Sarah massaged it, then Josse massaged and scraped it. After Josse's magic it felt a lot better. I could walk without a limp and could even jog a bit. Nevertheless I rode my bike for the kids run tonight just to be safe. Julia ran a mile in 9:37, then Benjamin ran 2 miles in 17:07 with Jenny running the first 1.5 in 12:59. Not counting biking miles because they were too slow. T4 Racer - 346.45 miles. A.M. The calf was runnable, but I decided to give it some rest and bike anyway. Rode my standard 10.1 course in 37:12, 3:41 per mile average, or 16.29 mph. Was pleased with that given that the trail has a lot of places where you have to slow down, and I had to get off the bike to make a 180 (did not stop the watch for that). On a straight flat stretch I was going about 3:20 per mile pace, or 18 mph. The bike does have issues. It is a 30lb old mountain bike that has not been maintained. The third (highest) front gear does not work. The second gear makes a funny noise, the chain is rubbing against something. The frame is too short and the seat does not go up very high. I did 17:52 going out, and came back in 19:10. Out is a slight downhill. HR maxed out at 149, and averaged 134. To get that HR running I would need to be going about 6:20 pace. So I figure if we say I worked at around 7:30 pace equivalent we can call this a match for 5 miles of running. Will run with the kids tonight and possibly some more if feeling good. P.M. 1 mile with Julia in 11:25, 2 with Benjamin in 16:44. Jenny joined for 1.5 in 12:48. Calf felt good enough to run on without limping, but still painful. Wore my cushioned old running now mostly walking shoes. Nike something, do not remember what, too lazy to take them off to find out. I did run DesNews in them last year, though. I imagine they have about 3K miles. But for me it is a cushioned shoe. A.M. Woke up, the calf felt significantly better walking, but still quite a bit of pain. Nevertheless, good enough to run 10 miles on. Was originally planning on running in my old Nike shoes to get more cushioning, but then had a crazy thought - try Five Fingers. Somehow in spite of all logic against it the feedback from my body was that Five Fingers would be a better option. So I put them on. Was able to run with only minor pain right from the start. As the run progressed, kept adjusting the form to minimize the calf strain. Eventually I figured out how to turn the calf slam into a calf stretch. Amazing! All you do is dorsi-flex the ankle (pull the foot towards yourself to make it look like you are duck) prior to landing, and it does not hurt. You are just getting a pleasant calf stretch from the impact. I kept speeding up from 9:30 pace at the start to 7:00 pace at the finish. My total time for 10.1 was 1:16:58. The calf felt the same when I was done. Jogged another 0.1 to meet Sarah and jogged with her some more, but will not count is as running mileage since she was going around 15:00 pace. My rough standard for running mileage is sub-12:00 unless recovering after a hard interval. The quads were only very slightly sore, but so were the gluts and the hamstrings, and I am not sure if it is from the marathon or yesterdays bike ride. So the calf problem perhaps was a blessing in disguise. It forced me to run slower, and not hammer the rest of the body so much. This is actually the first time I came out of DesNews with quads that I can run on the next day without wanting to scream. So I guess now I know the secret, or at least one way to do it. Run race pace for the first 2 miles, a little slower later on, get to the half in 1:13, then gradually taper off to 6:20-6:30 pace in the last 8 miles. I have always wondered if I could avoid soreness by running it slower, now I know. Recalled a conversation after DesNews. I could barely walk afterwards. As I limped towards Matt's car, I wondered out loud: "How in the world did I manage to run 6:45 pace in the last mile on a calf that now would not even let me walk without a serious limp?!" One runner overhead it and answered: "By the grace of God!" I contemplated the depth of the answer and agreed with his assessment. Of course, there is a physiological explanation. I was already running at mile 25, my HR was higher, there was more blood flow to the damaged area, the muscle was warm, the endorphines were helping me dull the pain, and being in a mental state of racing helped my brain disregard pain signals as well. But I wonder how often we provide those technical explanations that in essence say something to the effect "it worked because it worked", "the car was moving because its wheels were spinning while in contact with the ground", and in the process having filled our minds with enough non-essential detail and thus satisfied our curiosity, or at least having satiated our ability to receive knowledge, we fail to understand the more profound force behind the event. We acknowledge the creation and its mechanics, but fail to give credit to the Creator. Why? Because He does not reveal Himself unless we have faith. With faith, we gain the ability to see past the fact that the spinning wheels make the car move and are able to recognize that the car is moving because somebody is driving it, and that it will go where the driver wants it to be. P.M. 1 with Julia in 10:48, 2 with Benjamin in 16:34, Jenny ran the first 1.5 in 12:43. Five Fingers - 800.55 miles.